or 317-658-2964 for information on our custom knives. "Principal photography by Oleg Volk. Other photographs by Mike Williamson and John Eaves." 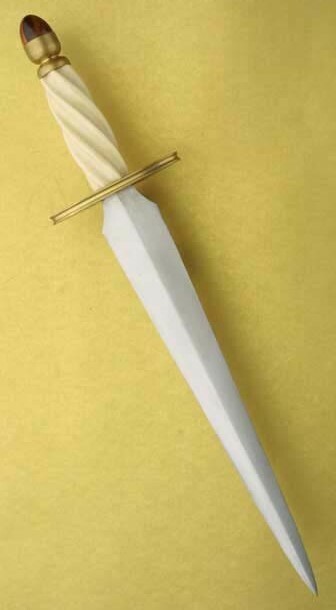 This lovely lady's bodice dagger features a brass blade and hilt with an amber flower. Very comfortable to wear or hold, and slots right into a laced bodice. 5" overall. 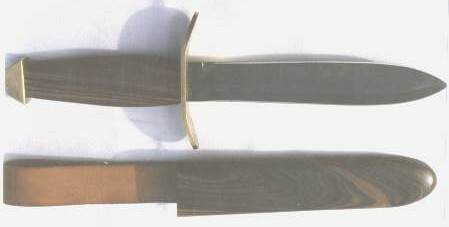 16" overall, 10.5" blade of ATS-34, high carbon or Damascus. Hilted in exotic wood, horn or artificial materials. Fittings of brass or stainless. 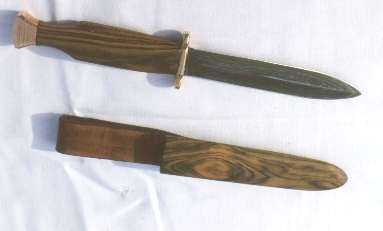 Shown here with Bocote hilt, brass fittings and ATS-34 blade. 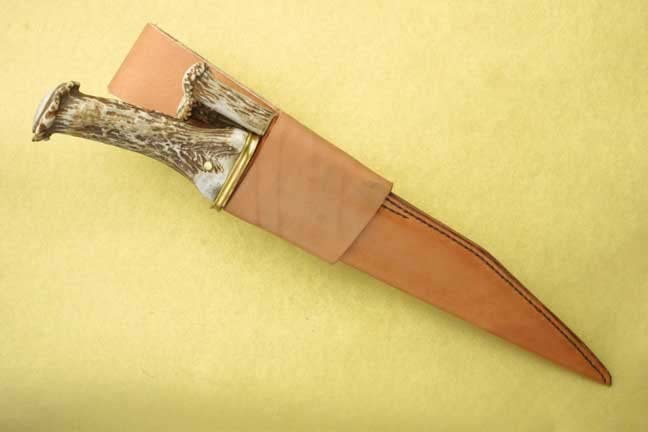 With leather or kydex sheath. 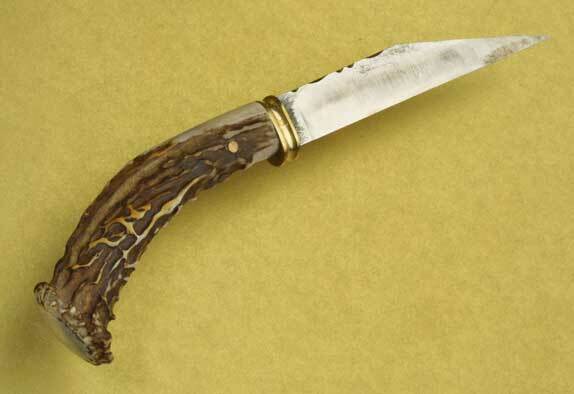 6" blade with choice of exotic wood or horn handle, set off by brass or nickel silver spacers. Tastefully embellished and finely finished. Comes with a velvet lined presentation case. 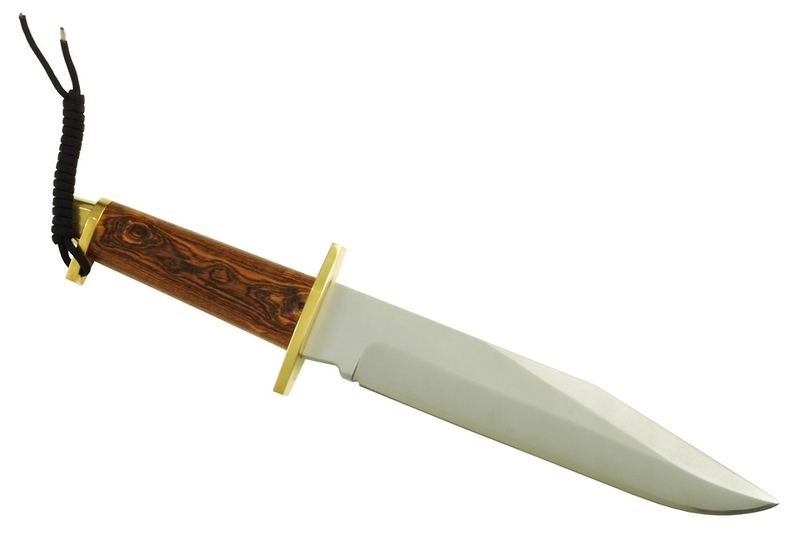 12" blade with fluted handle of wood, horn, ivory or artificial pearl. Semi-precious stone set in pommel. Shown here: imitation ivory and red tiger-eye. 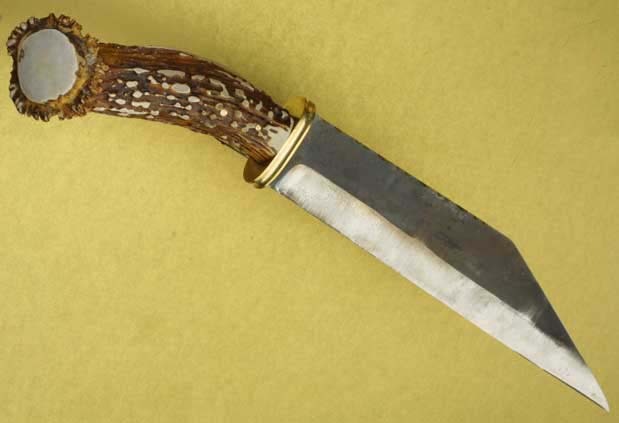 Schlager blade by France Lames, hilted in amber, horn and brass. Extensively decorated and fileworked. Competition legal for many re-enactment groups. 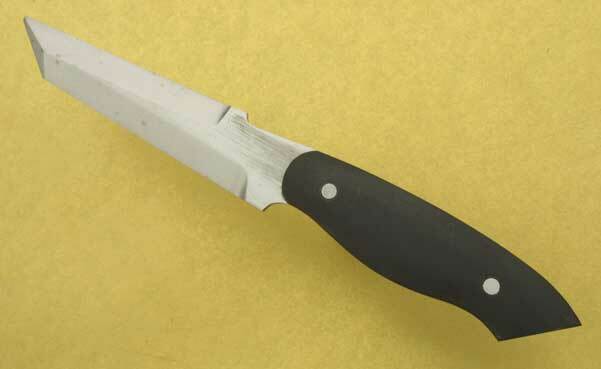 12" blade, robust grip and tang. 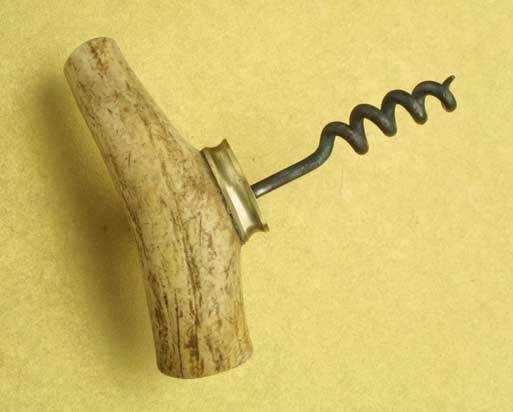 Plain wood handle and solid guard with hex, pyramid or round pommel. Spacers extra. Leather sheath included. 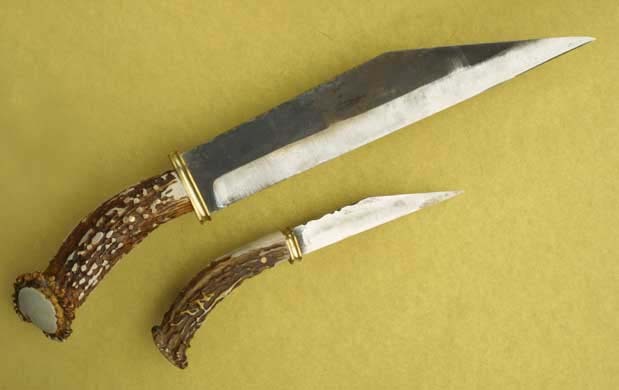 Hilted and sheathed in impala horn, with silver fittings, set with garnet, amethyst and amber. Comes in a velvet-lined presentation box. 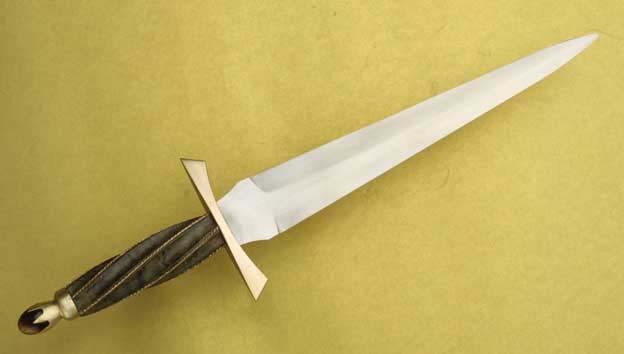 Fluted grip with inlaid wire, pommel set with stone, wooden scabbard with metal fittings and embellishment. Shown with colored maple burl and tiger-eye with bocote scabbard. Double-ended and a great fantasy piece. Hardwood hafted, about 48" long. 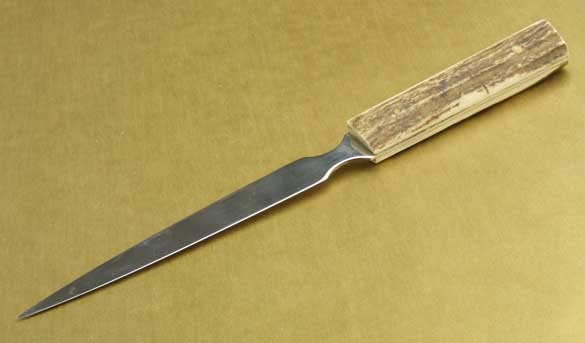 by Michael Z. Williamson The traditional side-knife of Scotland. 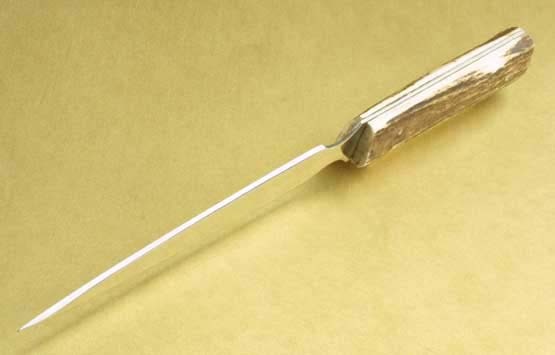 These handy little blades tuck into belts, stockings, and anywhere else a flat blade goes well. Crafted in carbon steel, stainless steel, or pattern-welded. 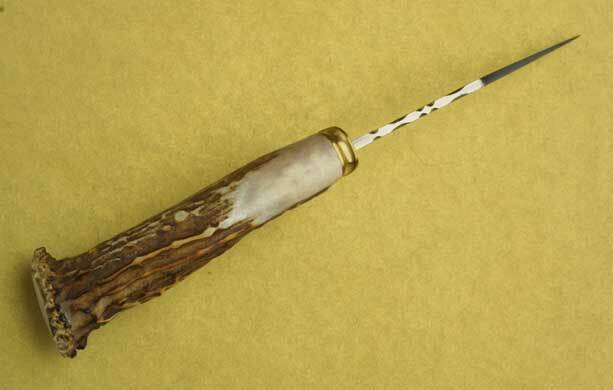 Hilts are in a variety of woods, horns or artificial materials. Leather sheath included. 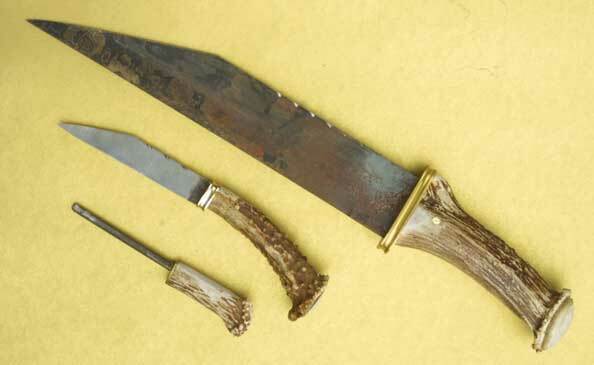 Viking or Saxon seax style Blades Priced on request. These can be fine finished or left rough from the forge for character. 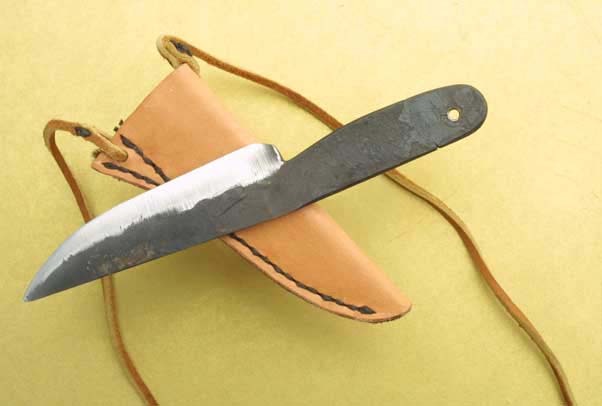 12" bladed large seax from $75, 4" from $35, hilted in walnut or maple. Exotic woods, horn and Damascus steel additional. Available as a matched pair, and with accessories like sharpening steel, spoon, bottle opener and hand wrought corkscrew. While the latter isn't entirely Viking, it's very practical. Hilted in fine woods or horn. Langseax. 24" overall, big enough to fight with, not big enough to trip over. 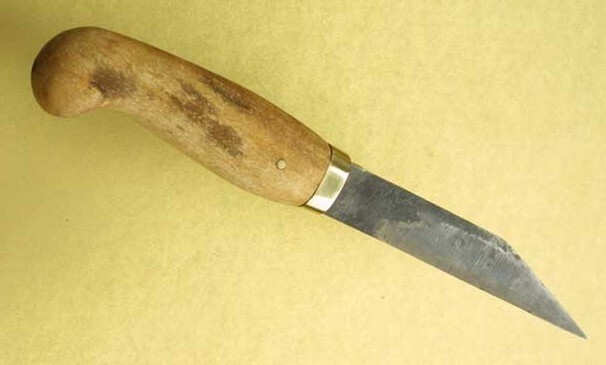 Also great as a drawknife, froe, or for chopping wood.